N.O.R.E. 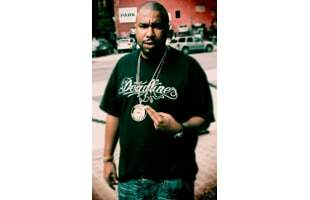 is one half of the group Capone-N-Noreaga. He blew up was a solo artist with his Neptunes produced track, Superthug. Listen to French Montana's "Off the Rip" f/ Chinx and N.O.R.E. Video: N.O.R.E. f/ Mayday & Tech N9ne "Dreaming"
Listen: Troy Ave f/ Noreaga "Dope Boy"
Listen: Raekwon f/ Capone-N-Noreaga "Chupacabra"
Listen: N.O.R.E. f/ Maze & Prodigy "N Luv Thug"